I have an HP server that came with an OEM copy of Windows Server 2008. I have installed CentOS 5.4 on the hardware and am trying to install Windows Server 2008 as a KVM guest. When I attempt to install Windows Server 2008 it complains that I am trying to install on unsupported hardware. This issue is caused because the hardware SMBIOS information is not being passed to the KVM guest. Before I go any further I want to state that what I am trying to do is within the license. HP offers a supported solution for VMWare but does not have an official solution for KVM. After much research the platform I am going to use is CentOS and KVM so please do not suggest other platforms. "You can dump SLIC table of your host bios and provide it to guest bios using -acpitable parameter." I used dmidecode and got the parameters that need to be passed, but I do not know where to pass the parameters into. Looks like CentOS 5.4 uses virt-install instead of qemu. Qemu is in the package manager and I was able to install it after uninstalling qemu-img (they conflict and qemu contains the packages in qemu-img). So now I know how to pass the acpitable parameters, but I am having trouble mapping what came out of dmidecode into -acpitable. The problem with branded media is that KVM's BIOS VM ships with diffrent ACPI tables. Installer on the other hand validates it. In the time of writing this I am using Debian 8 with virtlib 1.2.9 and qemu-system-x86 1.7.0 (qemu-kvm). So simply you need to have matched ACPI (dmidecode -t 0 and dmidecode -t 1) tables on VM to get it done. I had to install Lenovo's Windows 2012 Fundation branded media on Lenovo hardware. -r-------- 1 root root    165 Sep 23 13:44 ASF! It'll work for Windows 2008/2012 branded media. It's very important to check if those arguments are passed correctly, check VM's log in : /var/log/libvirt/vm_name.log. Run some live distro in VM, for example sysresccd and check output of dmidecode -t 0; dmidecode -t 1 it must match with hardware version. Unfortunately the answer involving the Windows signed drivers does not reflect the OEM / SLP activation. These drivers may improve performance but the Windows OEM / SLP activation strictly involves data stored in the BIOS, specifically the ACPI tables. Michael Tokarev was able to do this himself through modifying the source to include the SLIC table in the whole table format but he also mentions that this can be done using several options to -acpitable (http://kerneltrap.org/mailarchive/linux-kvm/2010/3/24/6260060). The change he made to the source simply allowed him to include an entire ACPI table instead of passing several arguments to include different aspects of it on the command line. I am looking into this myself now as I would like to implement this for testing purposes on some setups in our office. We have a lot of OEM machines and we can install fine on each machine but virtualization gives a lot of benefits for testing as well as very rapid deployment so I would like to see this through. I would like to the OP of this post, rancidfishbreath, what he extracted from dmidecode, how he formatted this in the options he gave kvm, etc. If you can add any input the developers gave you on this, I would appreciate it. Not the answer you're looking for? Browse other questions tagged windows-server-2008 centos kvm-virtualization hp or ask your own question. 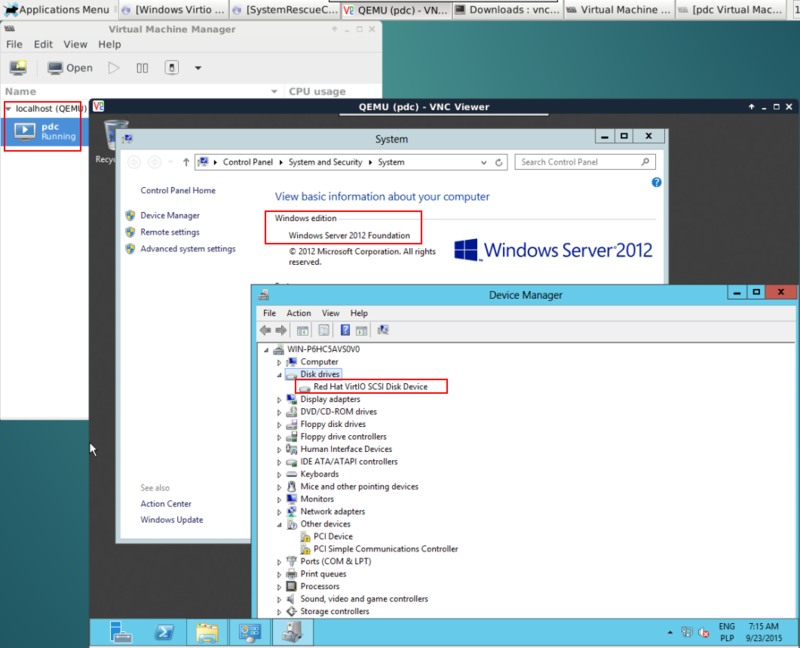 How to add a serial COM port to Windows server 2008 using Linux + KVM + Qemu?